Freely move the blue points on the left. When happens to the red points on the right? If the blue points lie on the graph y=ax^k, the red points will lie on a straight line. Can you tell the equation of that line? This applet is created for discussion about 2014 HKDSE Q15. I use the GeoGebra Classic for this construction. I use two graphic windows (1 and 2). The second one graphic 2 is opened in the later part of the construction. To put objects (such as points) in graphic 2, click inside that window first before entering the expressions in the algebra window. 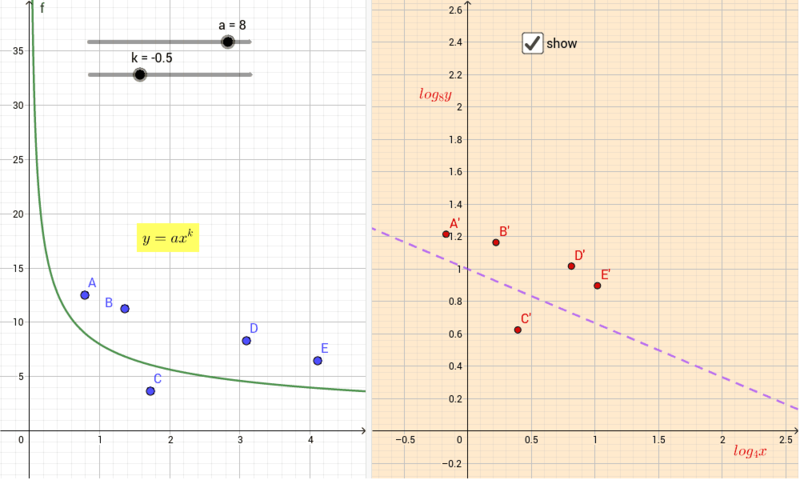 For example, the points A', B' and C' are shown in the graphic 2, but not graphic 1.
log function can be entered with more than one way. The one I use can be log(b,x), which means log of x with base b.
x(A) and y(A) in the expressions mean x- and y- coordinates of the point A.